Rear left to right – Anthony Finn, Trudy Groves, Alison Hunt, Simon Norris, Roland Wallace, Jonathon Featherstone, Paul Norris, Christopher Sheppard, – , Neil Sheperd, Mark Turner, Jeffrey Marston. 3rd row left to right – Richard Ellis, Shaen Eeles, Sarah Collett, Terry Newbegin, Sharon Fox, Sue Carden, Linda Johnson, Guy Titchmarsh, Anthony Wright, Lynn Govan. 2nd row left to right – Alison Mills, Fiona Clifford, – , Christine Graham, Edna Lindfield (teacher), Roy Catton (Headmaster), Ruth Gardner (teacher), Barbara Strange, Susan White, Penelope Lindfield, Sally Payne. Front left to right – Ian Weston, Karen Duffy, Kay Westlake, David Foster, Dawn Newberry, Mark Thatcher. This page was added on 15/09/2010. 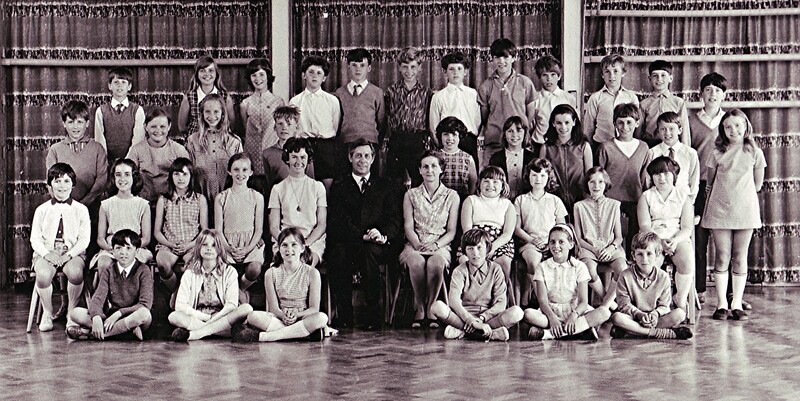 I also have a copy of this class photograph from Redbourn Junior School. My name was Sue Carden back then and as Mark Turner has already mentioned, I am the girl standing between my dear friend Sharon Fox and Linda Johnson. Great to see myself this photo again after all these years, (I have an original somewhere) but my name is not correct, I’m between Shepherd and Marston on the back row, Mark Turner, ( no relation to Kevin). John Holland I remember from back then but not at the Junior school. I was only at the Juniors for the last 6 months of the 4th year, before going to the secondary school up the road. We had moved to Redbourn from Marshalswick, St.Albans. Also missing is the name of the girl between Sharon Fox and Linda ( Lydia?) Johnson, but I can’t name her. Great job, enjoyed having a look around the site. Thank you, Geoff, for posting this photo. These were all the people I went to Redbourn Junior School with until my family moved away around 1969. It was a lovely reminder of good friends & happy times. What a shame that Facebook wasn’t around in those days as I lost touch with every single one of them.